It might not be the hard-hitting shot-adding sanctions that everyone seems to want put in place but it’s a start. The European Tour have announced a new pace of play policy to try and shave off 15 minutes per round. And none other than World No 1 Jordan Spieth was the first to make the headlines. The McIlroy-Spieth-Fowler threeball were monitored from the 4th hole and Spieth then got a ‘bad time’ on the 8th green. The new rule states that any player who exceeds the time allowed – 50 seconds if playing first, 40 seconds otherwise – and two monitoring penalties in a round would result in a £2,000 fine. European Tour chief referee John Paramor explained: "We will now be with the players, rather than informing them that they are out of position and leaving them to do it (catch up) by themselves. We found that had mixed success." Needless to say the players saw weren’t overly impressed. Spieth said: "I got a bad time on my putt and the guys behind us hadn't even reached the fairway on a par five. "I understand that if you are being timed and you are taking longer than the allotted time, you get a bad time. I understand the rule but it doesn't make a whole lot of sense when our group had caught up." But Paramor insisted that everything was done correctly. "Pace of play on the European Tour is measured by whether a group keeps to the starting interval between groups, rather than if they are on the same hole, as it is in America. 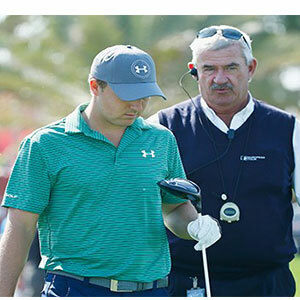 Jordan was assessed a monitoring penalty after his putt on the 8th hole, which I advised him of as he walked to the 9th tee." England’s Daniel Brooks was also issued a monitoring penalty in the second round and France’s Benjamin Hebert made it three people on the list on Sunday.